This tutorial will demonstrate localizing the RadChart title, series name and chart series item labels. The example will use local resources and use implicit expressions to bind them. See Multi-Language Support for RadChart for an overview of localization options. Create a simple ASP.NET AJAX enabled RadChart application. 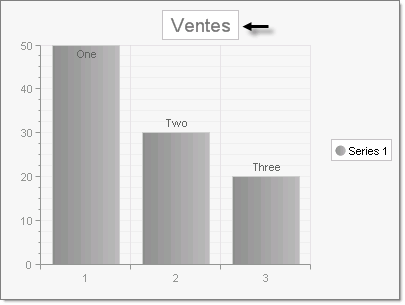 See Quick Start: Create a Bar Chart with Simple Static Data for an example. The following steps assume the web page is named "default.aspx". 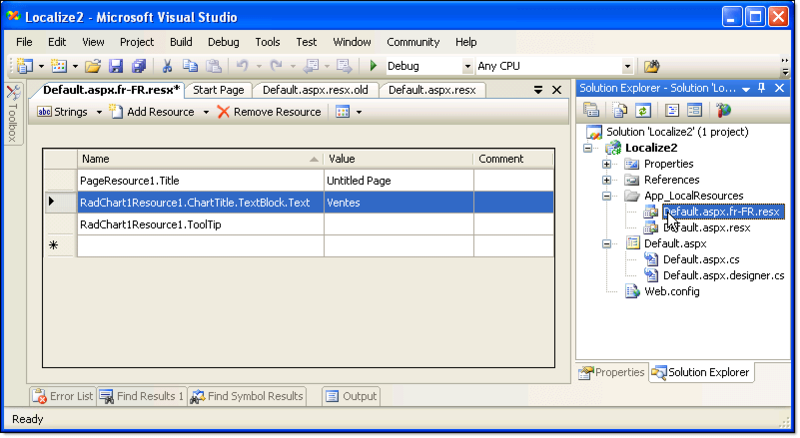 In design mode of the Visual Studio 2005 IDE select the menu Tools | Generate Local Resource. Notice that in the Solution Explorer a new "App_LocalResources" folder is created and populated with a resource file named default.aspx.resx. Add a new entry named "RadChart1Resource1.ChartTitle.TextBlock.Text" with value "Top Sales". Some entries may already exist for the page title and chart tool tip. In the Solution Explorer, copy "Default.aspx.resx" and name it using the culture code for French, "Default.aspx.fr-FR.resx". 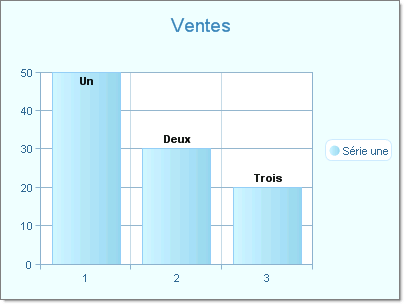 Enter "Ventes" for the "RadChart1Resource1.ChartTitle.TextBlock.Text" resource name. Run the application. The chart title should still be "Sales". In the web browser (we will assume Internet Explorer for this example), select Tools | Internet Options | Languages. In the Language Preference dialog click the Add button. Locate the France "fr-FR" culture code and click OK. If there are other languages in the Language Preference dialog list, use the arrow keys to place "fr-FR" at the top of the list. Click the OK button to close the Language Preference dialog. Refresh the browser page.The title should now be localized to "Ventes". In the Default.aspx.resx file add the keys and values highlighted in the screen shot below.Notice how the the first part of each name corresponds to the resource key name in the ASP.NET HTML markup followed by the property name. Copy these items to the Default.aspx.fr-FR.resx file and provide the translated values as shown in the screen shot below.You can delete the old entries and copy and paste from default.aspx.resx. If you copy and paste, the designer may rename resource entries by appending a number.You may need to rename these back so they match the values of the other resource file.